Bukta brought to an end the four-year reign of Umbro as England's kit suppliers, albeit through various distributors, at the end of the 1950s. At first, it was for two Wembley internationals in 1959, but as the 1960s began, so did a new era for England's kit. Few will have noticed, as the shirt still appeared to be the same v-necked tee-shirt with the emblem sewn on that they had worn since 1954. The practice of adding the opponents' name and the year in a scroll underneath the emblem continued until the end of the season and England's trip to Budapest in May 1960 was the last occasion that the opponents' name would appear on the shirt until the day of David Beckham's free-kick heroics in 2001. The eagle-eyed may have spotted that the style of number had changed on the back of the shirt and that it was now navy blue for every game, instead of being colour-coordinated with the socks, as had been the norm since the war. However, by 1962, it had switched to red and would remain red until 1995 (as far as we can tell). There seemed to be some debate as to what colour the socks should be. They began the 1960-61 season in the same red pair with the white band around the calf. These had been the first choice since 1957, but they then tried out three different designs in consecutive matches before reverting back to the trusty red pair for their end-of-season games in Portugal and Italy. The following season saw a couple more variations, but it was the white pair, with a red and a blue stripe, that finally got the nod as the preferred design in the run-up to the 1962 World Cup in Chile. White was, presumably, felt to be a colour that fewer teams clashed with than red and this decision was borne out by the fact that white has been well and truly established as the first-choice sock colour ever since (aside from a brief retro-dalliance with red again in 2016-17). There was still further tinkering to be done, however. At the 1962 World Cup quarter-final, against Brazil, half of the England team appeared to be in plain white socks, though it was probably due to the stripes being hidden from view by creating a large turnover. The red and blue cadet stripes were eventually discarded when England went on tour at the end of the 1963-64 season, creating the most simple strip combination possible of white and navy blue. The introduction of short sleeves for every game since 1954 was certainly a step forward in terms of lightweight attire, but it was still recognised that England had to play some games in cold weather. This was possibly behind the reason to introduce a long-sleeved version of the v-neck shirt in 1963, to be worn alongside the short sleeves, depending on each player's preference. This was also the year of the Football Association's centenary and to commemorate this, a special emblem was introduced (left). The shirt top left was worn by Johnny Haynes in the 1962 World Cup and is from the England Match Shirts section of the Neville Evans National Football Shirt Collection, kindly supplied by curator, Simon Shakeshaft, as is the number-five shirt (second and third from the left), worn by Maurice Norman against East Germany (GDR). Richard Clarke's 'Three Lions - England Match Worn Shirts' Facebook Collection supplied the shirt (to the right) bearing a blue number 11 and worn in 1960. This shirt was then replaced by a crew-neck long-sleeved version for the F.A. 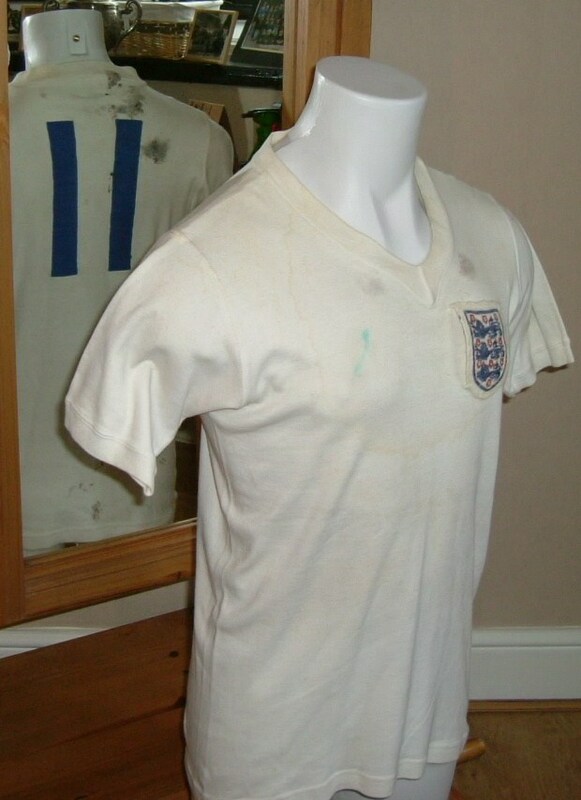 's Centenary match, but the short-sleeved v-neck was reinstated for two more games at the end of each of the next two seasons, before being replaced again by the crew neck for Bukta's final appearances as England's kit supplier in 1965-66. Thanks to Dave Hewett for spotting that the socks worn against Spain in October 1960 had calf stripes, and to Dave Moor and Simon Monks from historicalkits.co.uk for clarifying the colour of the socks worn against Wales in 1960. 1958-59 Please note, between 1957 and 1962, England's first choice socks were red with a white band around the calf. Notes England wore the white home shirt and blue shorts, with white socks with a red and a blue stripe around the calf, against Yugoslavia. Notes England wore all white; the white home shirt, with the white away change shorts and white socks, with a red and a blue stripe around the calf, against Spain. Notes England wore the white home shirt and blue shorts, with white socks with a red and a blue stripe around the calf, against Spain. Notes England wore the white home shirt and blue shorts, with red, blue and white hooped socks, against Wales. Notes England wore the white home shirt and blue shorts, with white socks with a red and a blue stripe around the calf, against Scotland. Notes England wore the white home shirt and blue shorts, with white socks with a red and a blue stripe around the tops, against Mexico. Notes England wore the white home shirt and blue shorts and socks, with a white band around the calf, against Wales. Notes England wore the white home shirt and blue shorts, with white socks with a red and a blue stripe around the tops, against Portugal. Notes England wore the white home shirt and blue shorts, with white socks with a red and a blue stripe around the tops, against Northern Ireland. Please note, although the red socks continued to be worn at several matches up until 1963, the white socks, with a red and a blue stripe across the tops, first worn against Mexico, in 1959, began to take precedence from hereon in. Notes England wore all white; the white home shirt and socks, with the white change shorts, against Argentina. Notes England wore all white; the white home shirt and socks, with the white change shorts, against Brazil. Please note, throughout the F.A.�s Centenary year of 1963, a commemorative emblem was worn on the shirt. Notes England wore the white home shirt and blue shorts, with red socks, with a white band around the calf, against Brazil. Please note, from this point onwards, England's first-choice socks were plain white. Please note, these two games may have been in Umbro shirts. This has yet to be confirmed. Notes England wore all white; the white home shirt and socks, with the white away change shorts, against Sweden.